I'm sure most of you busy working ladies know how hard it can be to eat healthy. During the day, when you are trying to meet deadlines, run a million errands, and chase kids it can be hard to think of something healthy to eat when you just want something fast. Right now I have two jobs and I'm not going to lie, it can be hard! It really takes planning ahead to be able to have something fast and healthy. 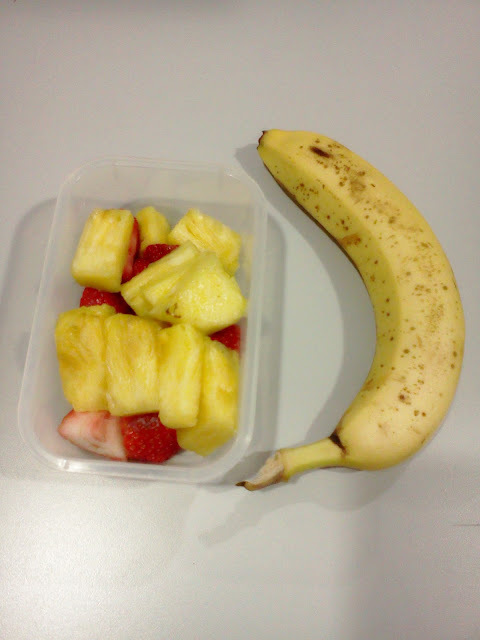 Below is a typical lunch for me.....when I take the time to plan ahead. To find this amazing Greek Salad recipe click here. It is by far my all time favorite salad with Ceaser and Cobb Salads as close runners up. 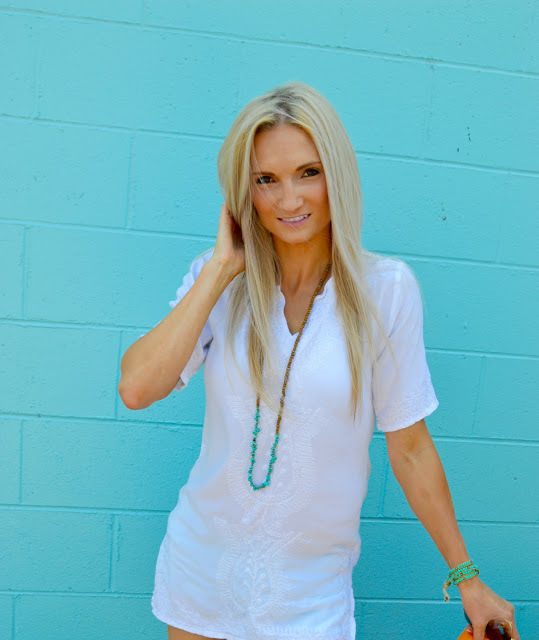 Scroll down for tips on how to make your daily lunches a little healthier!! 1. Buy Colorful Veggies like carrots, Red Bell Peppers, Orange Bell Peppers, and etc. Cut them up into slices after the grocery store and place them in individual snack baggies for on the go. Having a healthy snack available will make you eat them when you have the munchies!! 2. There are a lot of tupperwares now that cater towards salads! 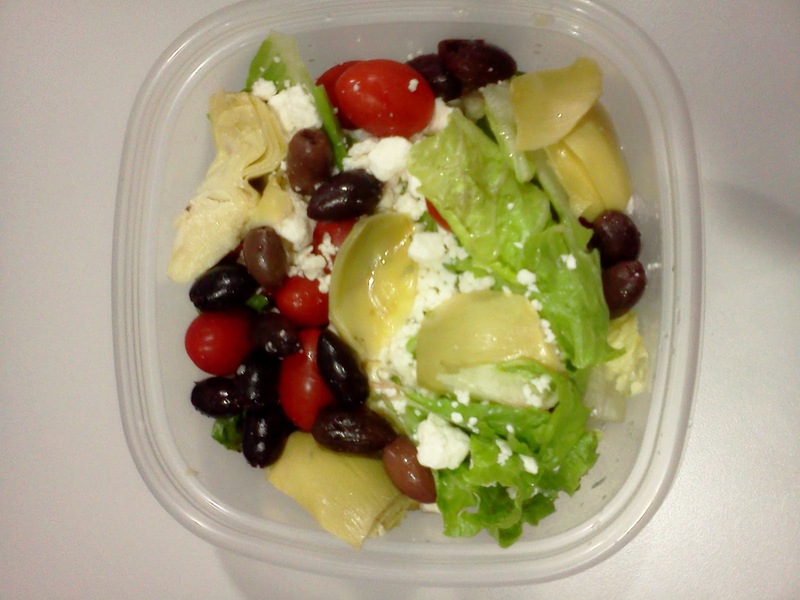 The ZipLock one I have for the salad pictured above has a small dressing cup that snaps into the lid. I used to not want to bring salads to work because I always had to bring the bottle of dressing but now you can just have it in a small seperate container!...Which is also the perfect portion size so you don't drown your salad ;) You can purchase these tupperwares at Walmart, Target, and Bed Bath and Beyond has some really nice ones with utensils packed in. 3. 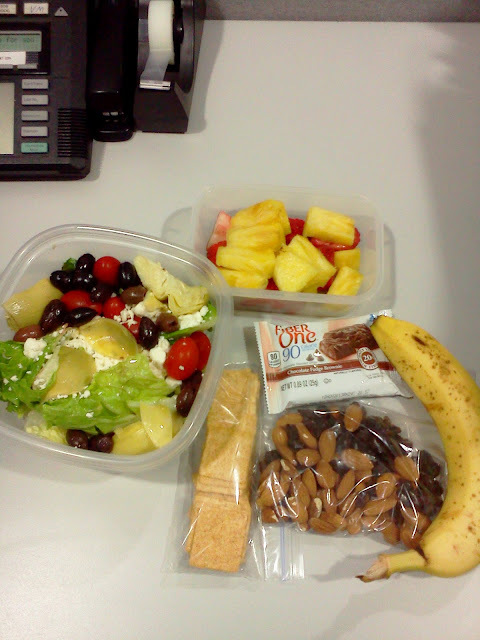 If you noticed I have a lot of snacks with this lunch. I'll nibble on these throughout the day which keeps me content and prevents me from over eating. 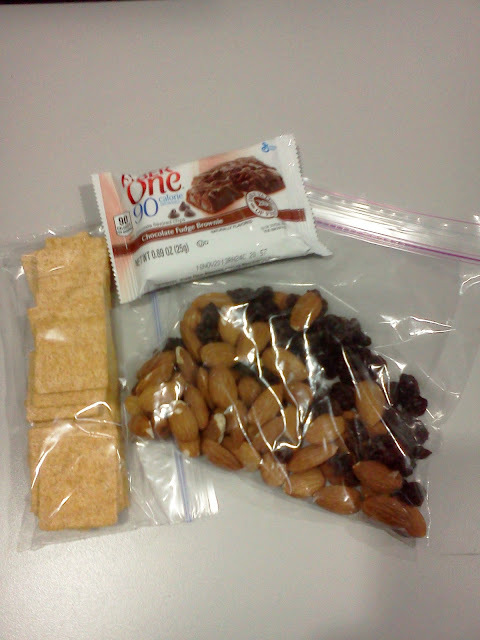 The snacks pictured include...Wheat Thins, Raw Almonds with raisins (craisins are best), fresh fruit, and a 90 calorie Fiber One Brownie as my treat ;)! Snacking on healthy snacks throughout the day is great for your metabolism! 4. Keep a bottle of water near. Sometimes when you're really thirsty, you can start to feel like you're hungry.....even if you've already recently eaten. To prevent over eating make sure you stay hydrated! Costco has great prices on fruits and veggies, so make sure you check out their fresh produce and stock up!! Whenever I make a point to have a good lunch ready for a day running around, I always feel a little less stressed and as a bonus I have more energy because of all the great nutrient packed food!